On Sunday afternoon my new grandmother, Nana, came over to the house to cook with me. I feel so lucky to be a part of this close family. Nana helped raise my husband, watching him before and after school throughout his childhood. She is still amazing, spunky and helpful. She does things like pick up our work shirts for ironing and sends over pots of beans when times get busy for us. During our afternoon together, I wanted to share some cultural dishes that my family enjoys. A gift of sharing something meaningful. This amazing woman was born and raised in Tepechitlan, Mexico. She has lived in Sacramento for over 60 years and is very adventurous – but on Sunday, I treated her to her first bowl of tabbouleh ever. She loved it! Full of love and genuine intrigue, she wanted to know each ingredient and what every step was so that she can make it at home. This exceptional recipe is from my good friend Gina. It is, of course, her family recipe. And the tomatoes are from our parents garden. Mix tomatoes, parsley, green pepper, green onion, tomato paste and lemon juice. Mix in bulgar and let sit in refrigerator for about 1/2 an hour. Before serving to add the olive oil and season with salt and red pepper to taste. 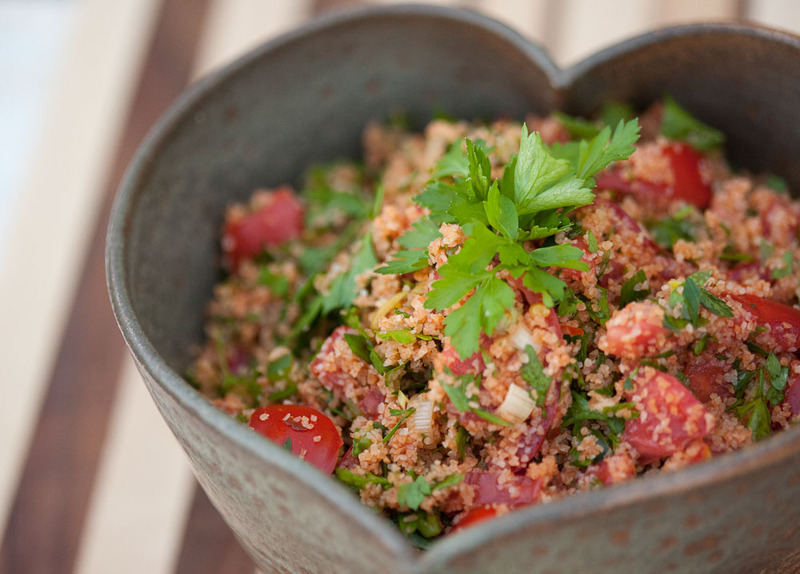 Note: The ratio between bulgar and parsley varies among cultures for this dish. Many do a much higher ratio of parsley than you see pictured above. It is a matter of taste. Bonus: this is already raw and vegan! Subscribe to Eat well, live free by entering your e-mail address for updates!